Maxene Magalona and Rob Mananquil's Boracay wedding on January 11 was one sweet and intimate affair with their close family and friends. 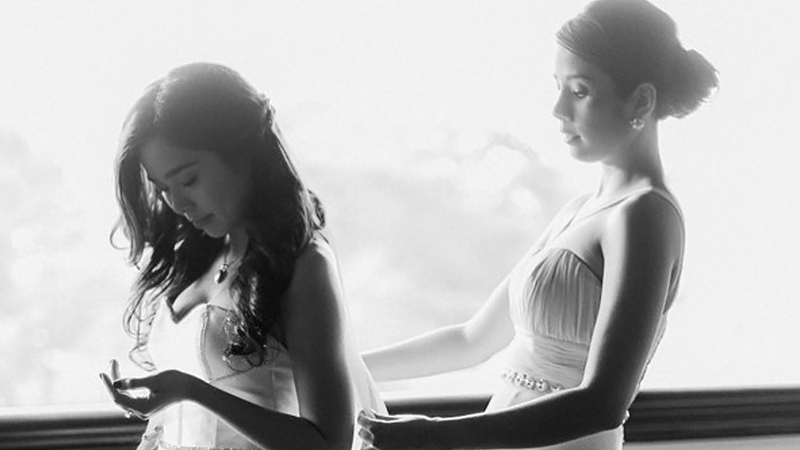 On Instagram, Maxene's sister and matron-of-honor Saab Magalona-Bacarro expressed her regret for not being able to attend the celebration due to her being pregnant with twins. Writing on the caption, she said: "Today my maid-of-honor gets married and, as her matron-of-honor, I'm so sad that I can't be with her physically. I recently learned that I'm not allowed to travel anymore until after the twins' birth. I really wish I could be there, but with her big and selfless heart, she told me not to worry about it because the safety of my babies is what's most important. I love you, @maxenemagalona, and I am currently crying buckets from Manila. (I'm also wearing my matron-of-honor dress in bed like a crazy woman. It's the hormones.)" 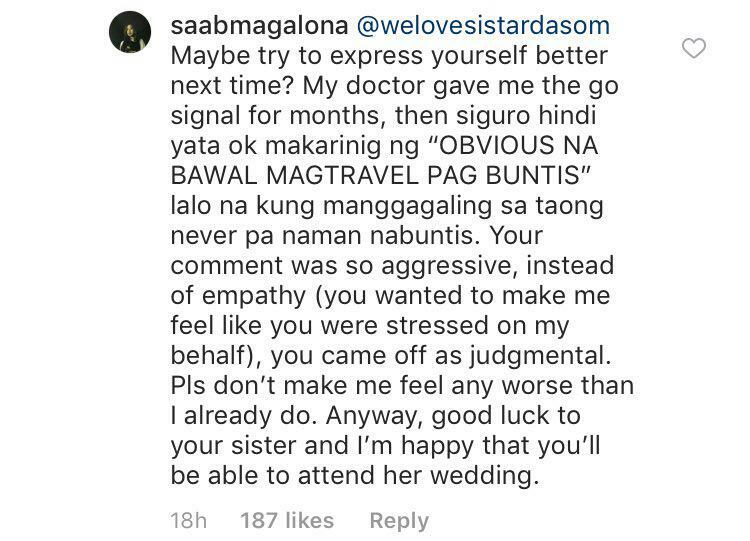 Saab missing her sister's wedding was, unfortunately, called out by a basher online. Instagram user @welovesistardasom wrote in the comments section asking why the ceremony had to be held in Paris when it is obvious that a pregnant woman won't be allowed to travel. The basher even suggested that the wedding should have been held in Manila instead. 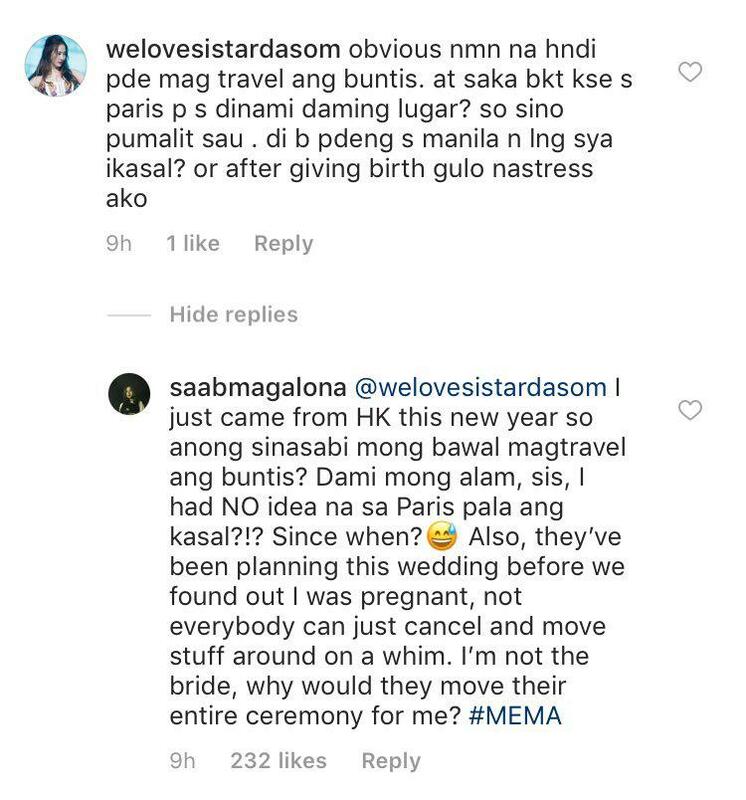 The 29-year-old mom-to-be clapped back and replied, "I just came from HK this New Year so anong sinasabi mong bawal mag-travel ang buntis? 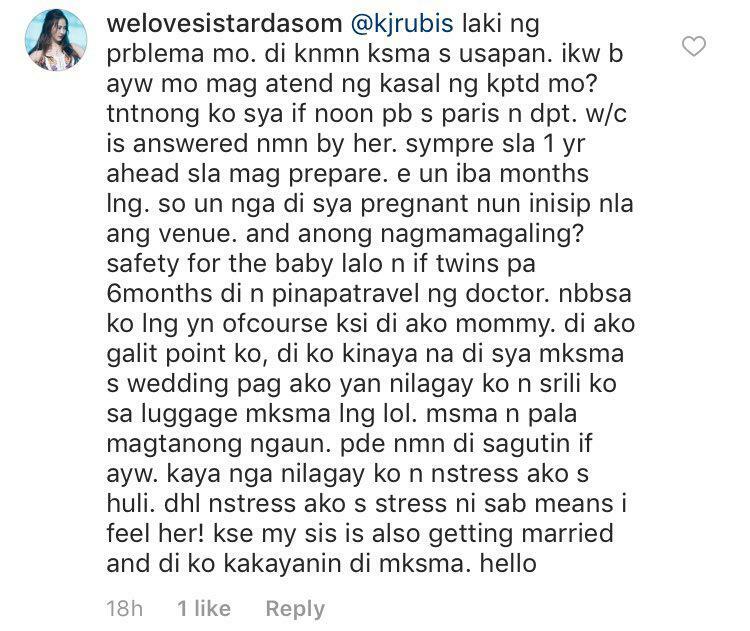 Dami mong alam, sis, I had NO idea na sa Paris pala ang kasal?!? Since when??? Also, they've been planning this wedding before we found out I was pregnant, not everybody can just cancel and move stuff around on a whim. I'm not the bride, why would they move their entire ceremony for me? 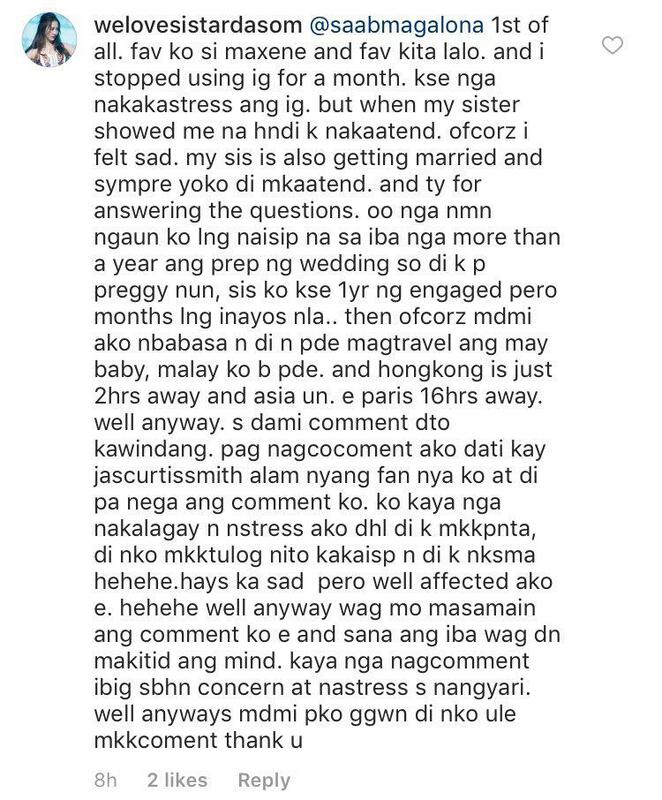 #MEMA"
But the comments quickly turned into a short exchange when the netizen tried to explain the nature of the message, saying, "'Di ako galit, point ko, 'di ko kinaya na 'di siya makasama sa wedding 'pag ako 'yan nilagay ko na sarili ko sa luggage makasama lang lol." Saab then replied and cleared the air, "Maybe try to express yourself better next time? My doctor gave me the go signal for months, then siguro hindi yata ok makarinig ng "OBVIOUS NA BAWAL MAG-TRAVEL 'PAG BUNTIS" lalo na kung manggagaling sa taong never pa naman nabuntis. Your comment was so aggressive, instead of empathy (you wanted to make me feel like you were stressed on my behalf), you came off as judgmental. Please don't make me feel any worse than I already do. Anyway, good luck to your sister and I'm happy that you’ll be able to attend her wedding." As it turned out, the exchange ended well with the two understanding their sides of the story.